Mr Dharmendra Pradhan addressing the Petrochemical Investors Conclave, at Bhubaneswar on November 16. Over Rs 30,000 crore would be invested over a two-year period to set up small scale industries in the petrochemical sector in eastern India, Union Petroleum Minister Dharmendra Pradhan said on Thursday. 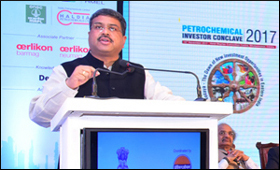 Speaking to reporters after inaugurating the Petrochemical Investors Conclave here, Pradhan said that over one lakh employment opportunities are likely to be generated in India's eastern region. Addressing the inauguration event, the minister noted that state-run Indian Oil Corp (IOC) has already commissioned a 15-million tonnes per annum oil refinery at Paradip port town on the Odisha coast at an investment of Rs 35,000 crore. He said IOC had signed another MoU with MCPI Ltd for setting up a textiles park in the state. "The polyester downstream industry can flourish very well in the eastern region as well," Pradhan said. "By achieving synergy of cotton fibre with polyester fibre to promote and popularise synthetic textiles, the textiles park will primarily benefit MSMEs (micro, small and medium enterprises) with employment potential of around 22 lakh," he said. IOC is also setting up a new polypropylene unit of 700 kilo tonnes per annum capacity at a cost of Rs 3,150 crore, which is slated to be commissioned at Paradip Refinery in 2018 to support the polymers and plastics industry, he added. Pradhan also said that the Chemicals and Petrochemicals Department would take up equity of an amount of Rs 40 crore in a Rs 100-crore special purpose vehicle (SPV) to set up a plastic park at Paradip in collaboration with the Odisha government. The Union Petroleum Ministry has also decided to join the SPV following a request from the state government, while the amount of equity would be decided soon.